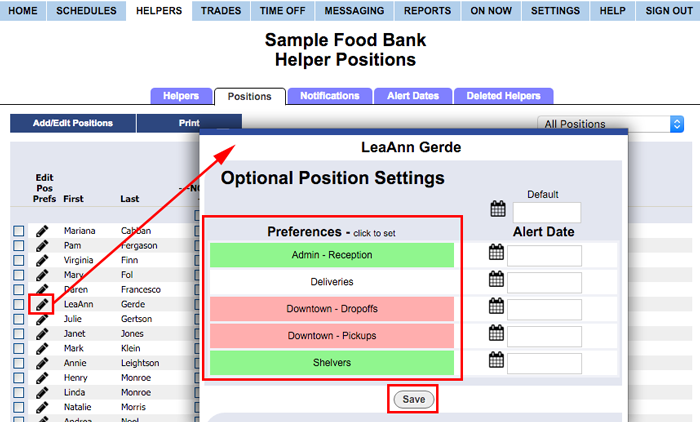 Helper Positions Grid - quickly review and edit Helpers' Positions and "Position Preferences"
You can set each Helper's positions (and optional position preferences) on their Add or Edit Helper page, or you can use the Helper Positions Grid to quickly set them for all helpers. When viewing the grid, you can see which positions are set for each Helper and any position preferences that are set. You can see a color in the cell background of each position. Positions preferences can also be set from the Edit Helper page or from the Positions Grid.